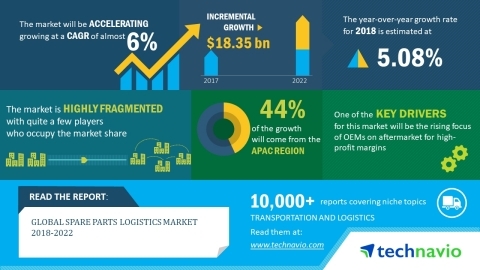 According to the global spare parts logistics market research report released by Technavio, the market is expected to accelerate at a CAGR of almost 6% during the forecast period. The increasing focus of OEMs on the aftermarket for high-profit margins is one of the key drivers for the spare parts logistics market. This research report titled 'Global Spare Parts Logistics Market 2018-2022' provides an in-depth analysis of the market in terms of revenue and emerging market trends. It also includes an up-to-date analysis and forecasts for various market segments and all geographical regions. In 2017, the automotive industry segment accounted for over 47% of the spare parts logistics market share and is projected to contribute to nearly 51% share by 2022, exhibiting over 3% increase in market share. The ability of the blockchain to ease tracking and traceability in the spare parts supply chain is an emerging trend in the spare parts logistics market. A blockchain is a series of the distributed database, which holds records of digital events in a tamper-resistant manner. Though several users can access, inspect, or add to the data, they cannot change or delete the information. The original information stays intact, which enables a permanent information trail, or chain, or transactions.